A research consortium led by Professor Saiful Islam has been awarded £3.2m to work on new sustainable materials for energy storage and conversion. 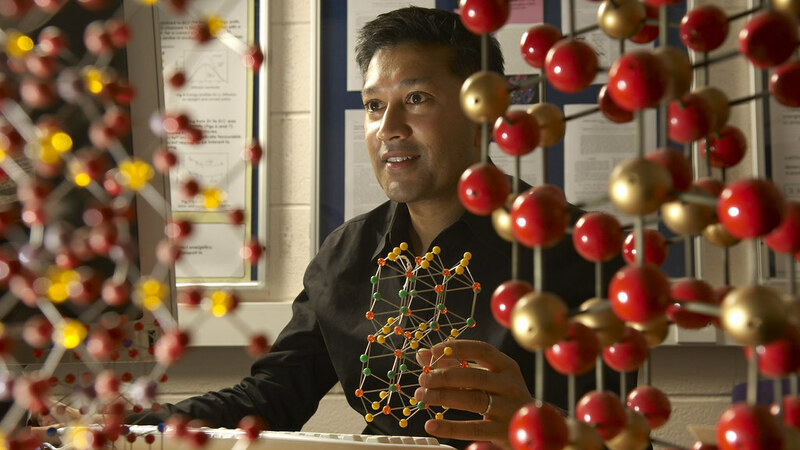 A research consortium led by Professor Saiful Islam (Department of Chemistry) has been awarded £3.2m by the Engineering & Physical Sciences Research Council (EPSRC) to work on new sustainable materials for energy storage and conversion. The new grant will fund a five-year project entitled “Energy Materials: Computational Solutions” to explore and develop new materials for the next generation of green energy devices, including solar cells, lithium batteries, thermoelectrics and fuel cells. The provision of clean sustainable energy is among the most urgent challenges to society and to the global economy, and poses fundamental, exciting scientific questions. Materials performance lies at the heart of the development of green energy technologies, and computational methods now play a vital role in modelling and predicting the atomic-scale properties of novel materials. Professor Saiful Islam from our Department of Chemistry is leading the consortium team which includes Professor Steve Parker and Dr Aron Walsh from Bath, and Professors Richard Catlow and Nora de Leeuw from University College London and Dr Paul Sherwood from the Daresbury Laboratory. The team also has strong links with industrial partners including Johnson Matthey and Sharp. The research team will develop and apply powerful techniques for modelling the atomic level operation of energy materials. Such fresh insights could unlock the door to new families of compounds with a step change in efficiency and performance.